Last year, millions of usually outdoors-averse gamers worldwide began walking miles across their cities every single day. The reason behind this surprising change was nothing less than the latest global phenomenon: Pokémon Go. This augmented reality (AR) game required players to catch digital monsters that appeared more or less randomly in real-life locations, and which . The app was downloaded by over 500 million people, and although the game quickly peaked, it kept enjoying a very healthy fanbase. The phenomenon may have faded, but it still holds important lessons for retailers, giving us some clear insights into what customers want. AR apps like Pokémon Go add a virtual layer over the physical, real-world environment, creating a gamification of reality. Augmented reality differs from virtual reality (VR) in its relationship with the real world: AR is projected over real-life environments, whereas VR tries to transport users into its own virtual world, for example with the use of special glasses. Both technologies have been around for a long time, and have been steadily increasing in usage in recent years. According to market intelligence firm IDC, the . Harvard Business Review believes that these technologies will “reshape retail” in the years to come. Retailers can use it to merge virtual selling space with their physical ones, overcoming physical barriers. For example, you could add a window where there is none in your store, or display a large selection of very heavy free weights without needing to reinforce your shelves. The customer-facing uses of AR applications are many, and promising: people can virtually try on clothes, decorate their kitchen or visualize on their smartphone personalized instructions to build their furniture. AR can thus become a valuable sales tool: superimposing products with real-life environments can help reduce pre- purchase indecision – and possibly cutting the rate of product returns post-purchase. Retailers can use AR to display more stock than they could possibly fit in their store location. Stores with limited selling space, such as those located in urban areas, can therefore finally compete on product selection with brands with more space – and bigger budgets. AR also enables retailers to easily personalize the product offering, and add tailored promotions based on personal preferences. Customer preferences can be gathered in different ways, for example using analytics tools as well as beacons. With AR, it is also possible to quickly change the look of an environment, and renew the product selection on display, at little expense. This is a cost-effective way to keep customers interested in visiting your store again and again. AR can help with shelf identification, for example to check the status of store aisles, providing warnings if an item is misplaced. Furthermore, AI helps you collect more information about your customers, enabling you to offer more personalized and enticing loyalty programs, with individualized rewards. By supporting your efforts to create a unique customer journey, AI can put you a step ahead of the competition. The costs of using augmented reality can decrease quickly, if the technology is implemented the right way. If you look at the cost split for IT, a retailer generally pays about 60% for hardware, 15% for software, 10% for services and 15% for content and maintenance. After a successful pilot project, it is recommended to implement AR in all your stores rather than heavily investing into one flagship store. Costs will decrease due to software and service scalability, and you can benefit from your experience with the pilot store. The special type of experiences you can create with AR can then become part of your image, strengthening your brand. In order to implement AR, it is essential to have an adequate data infrastructure and databases, which can process items in real time everywhere. Select a type of technology that is comprehensive and reliable, and which fits your, and your customers’, needs. The transition between virtual and physical should be smooth (if you offer a clunky experience, people just won’t be interested). The use of AR should be intuitive, and of value to your brand and your shoppers. Carefully analyze your goals and the customer journey, and based on that knowledge, create an omni-channel strategy detailing the instances where AR should be used, and what you plan to achieve. Don’t forget to note all technical requirements. Phenomena like Pokemon Go have given us a glimpse into people’s hunger for personalized experiences. Today, AR has become an affordable technology which can increase the shopping experience and create individualized, unforgettable customer journeys. Smart retailers are already implementing AI in their changing rooms, websites and loyalty apps – and customers are responding, loud and clear. 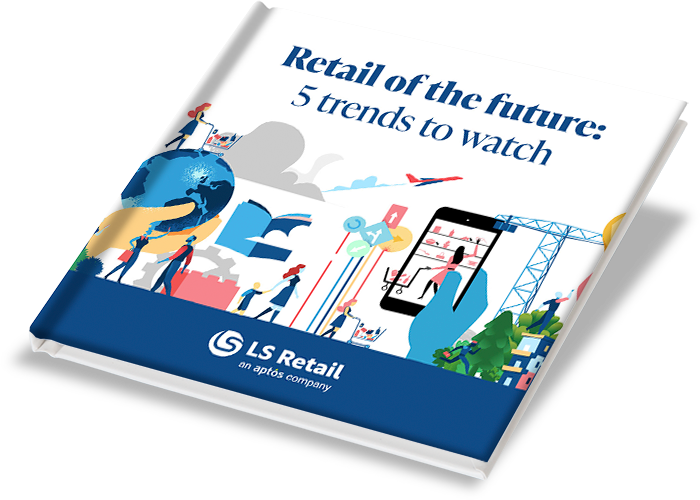 To keep up with the innovative technologies that are changing the face of retail, download our latest whitepaper on the hottest trends in the industry. Are you ready for the retail of the future? We have spoken to retailers, experts and pros in the industry, and identified 7 emerging retail trends and technologies. Just download our whitepaper. Know the trends. Be prepared. Win.